Professor Houze has been flown as a research scientist on many aircraft missions since the 1970's. He has flown through hurricanes and many other kinds of storms. 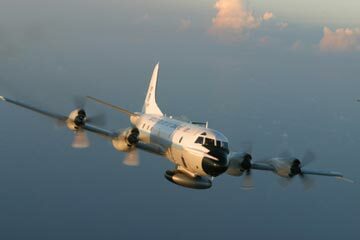 This is a picture of one of the U. S. NOAA "Hurricane Hunter" aircraft. Most of Professor Houze's aircraft missions into storms have been in this type of aircraft. It is a Lockheed P3 equipped with special weather radars and other equipment for making measurements in storms.